Today I have a fun item to share. 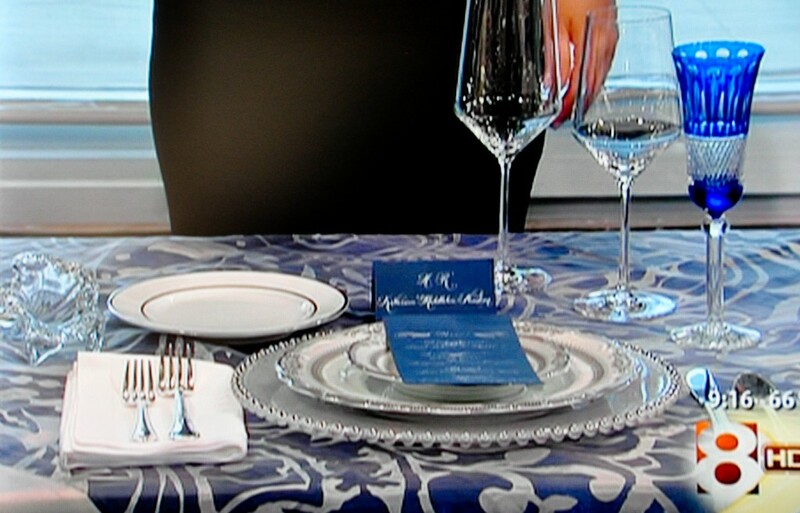 Back on March 25th Donnie Brown was on Good Morning Texas chatting about Royal Wedding Inspiration and used my menu and place card on his table set up. Thanks Donnie! 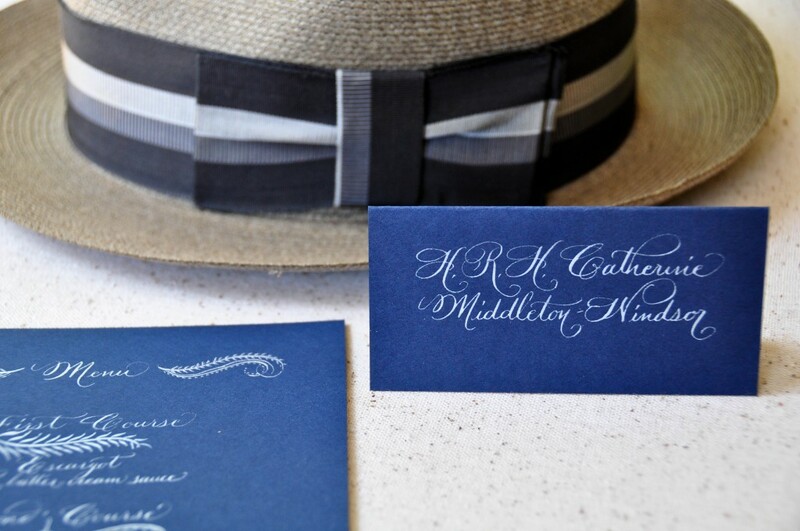 We used a lovely navy blue paper with silver ink in 100% calligraphy. 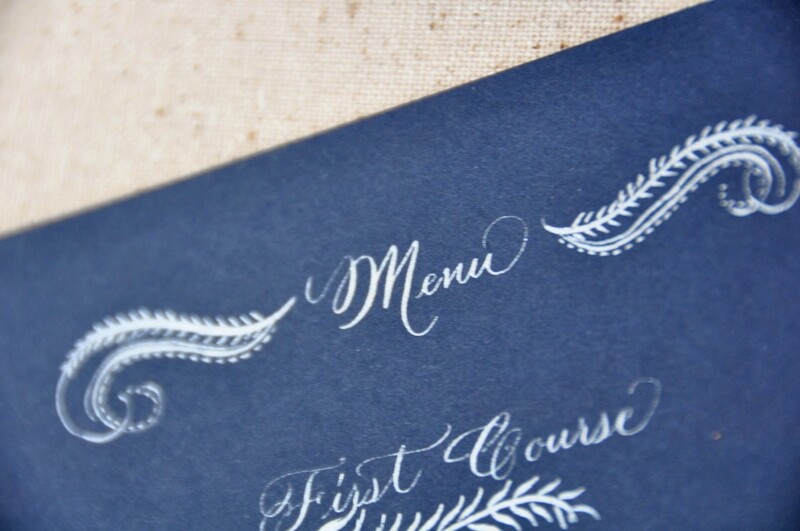 A close up of the menu header… I used a botanical inspiration for the flourishes. A screen shot from the products on Good Morning Texas! I must admit – I am very excited for the royal wedding. 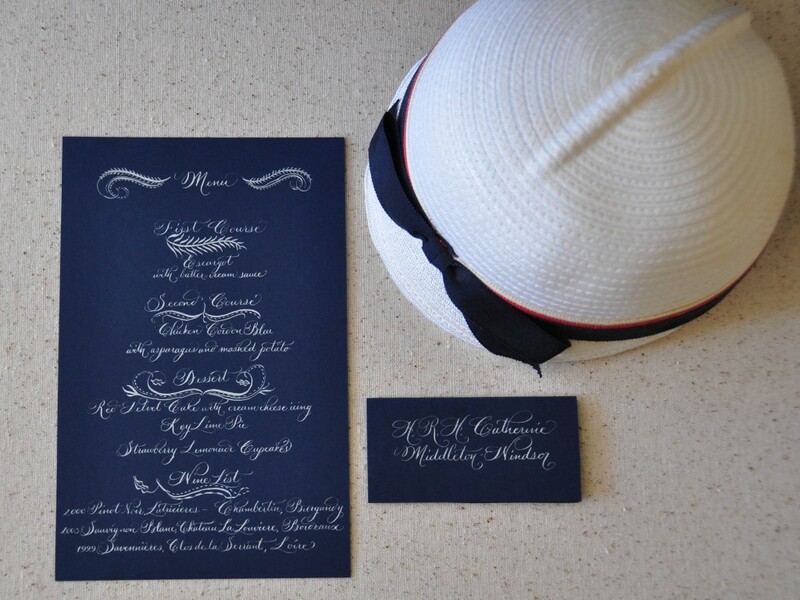 Who could not love a wedding for a lovely couple filled with gorgeous hats, an estate dining table, top notch calligraphy, top secret guest list and have it all shown live on worldwide Internet and television? I am giddy about the changes in the industry towards the grace and glamour this wedding will show off. The past few years have been filled with DIY and thrifting which can look nice if done well…. But I do love the over the top dramatic statement that weddings have to offer. Wills and Kate are determined (despite the fact that it is a “ROYAL” Wedding) to make this a wedding for the people. A perfect mix of both worlds. Some of the information about the wedding has been released so far… but some is still a secret. I’m curious – what are your predictions?…here is what we know so far! Wow – I cannot believe it has been almost a year since Adam and Sarah married! Last spring I had the joy of addressing their envelopes for the lovely and unique Vera Wang invitations they picked. I used the Grace font in black ink. Very classic and elegant. For their reception Sarah worked on a little DIY candy bar signs that turned out lovely with the shape and pop of tangerine. 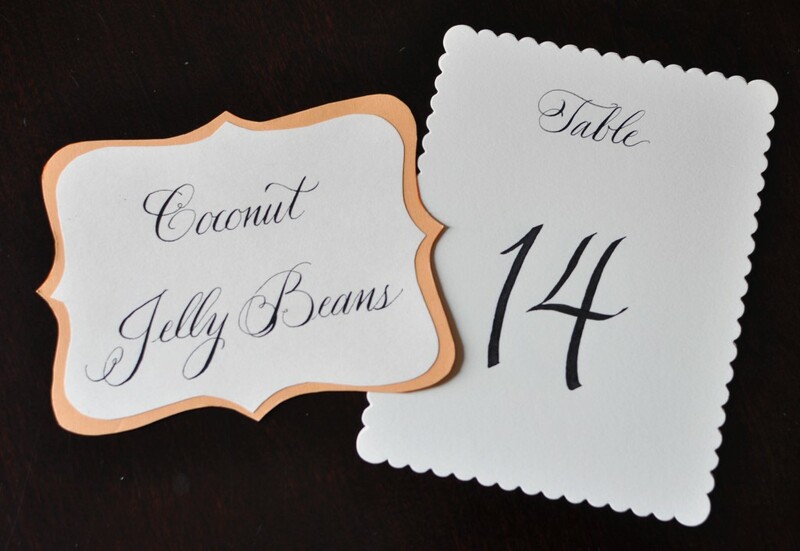 I used the same font and color to keep the theme going for their lovely reception at the Crescent Hotel. 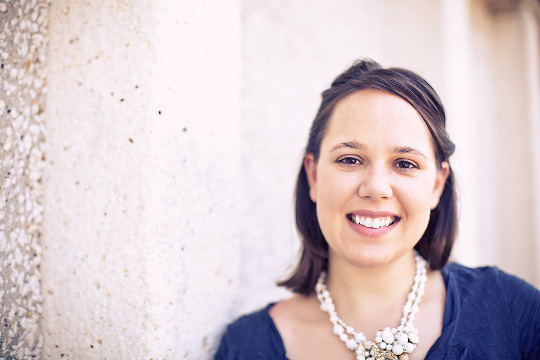 I was thrilled to work with designer Allison on addressing her wedding invitations. 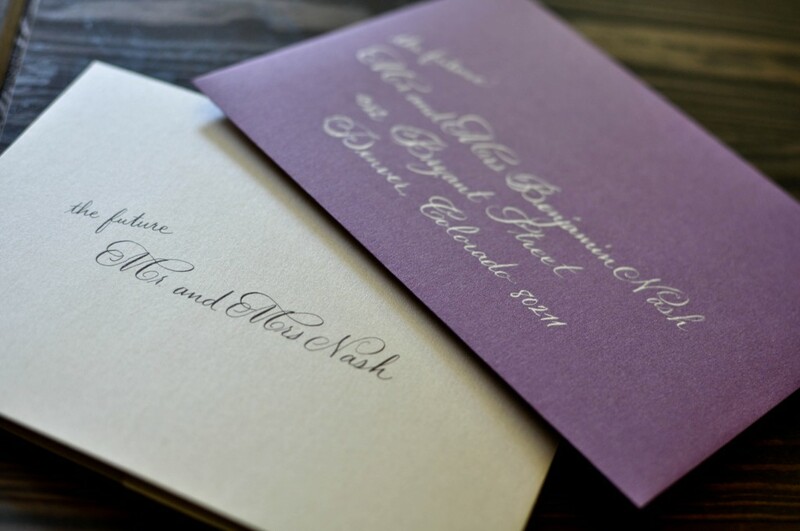 She chose to use a dual color envelope set with purple outer and silver inner so we chose to use 2 color inks with the grace font. 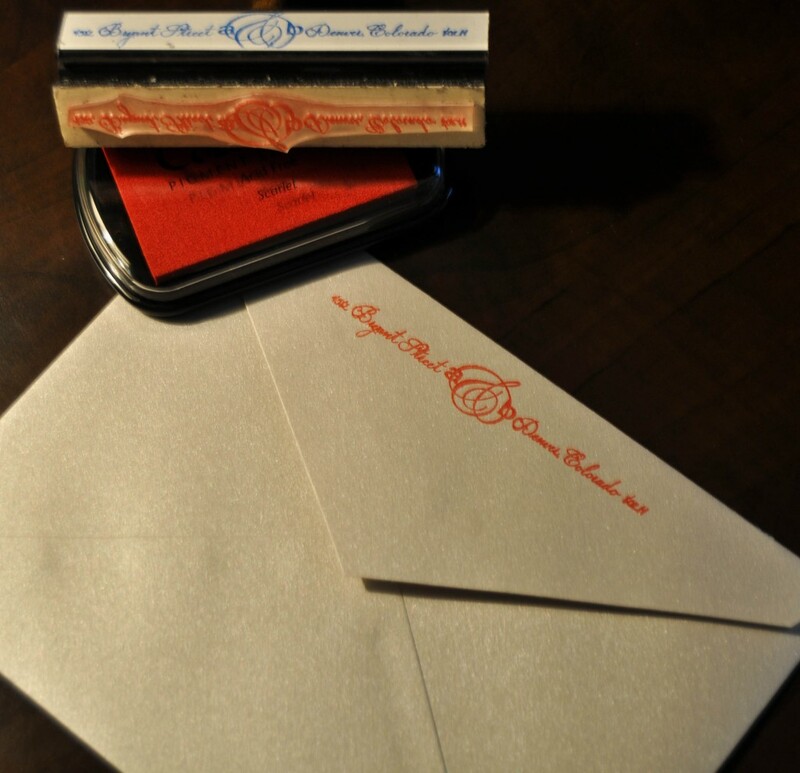 And to save some printing funds – Allison ordered a custom calligraphy address stamp (I am sure she used black rather than the red I had!). 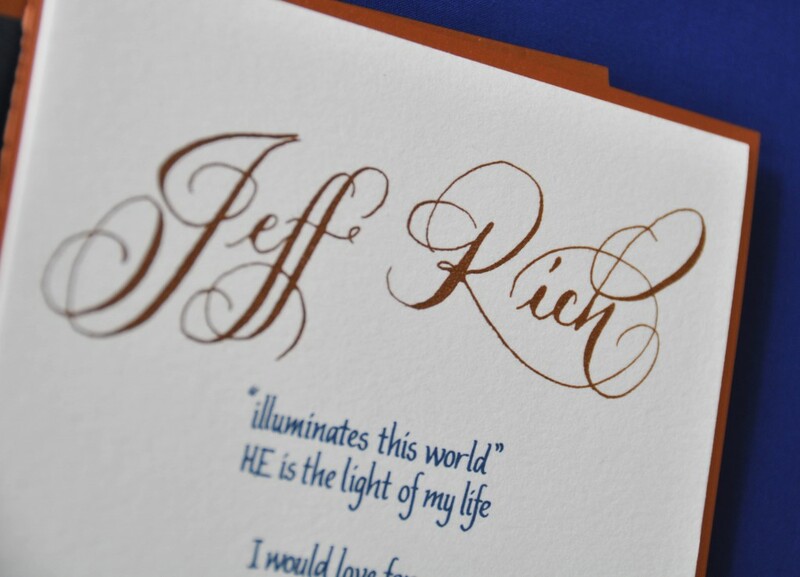 We incorporated her logo in the address to make it extra special. 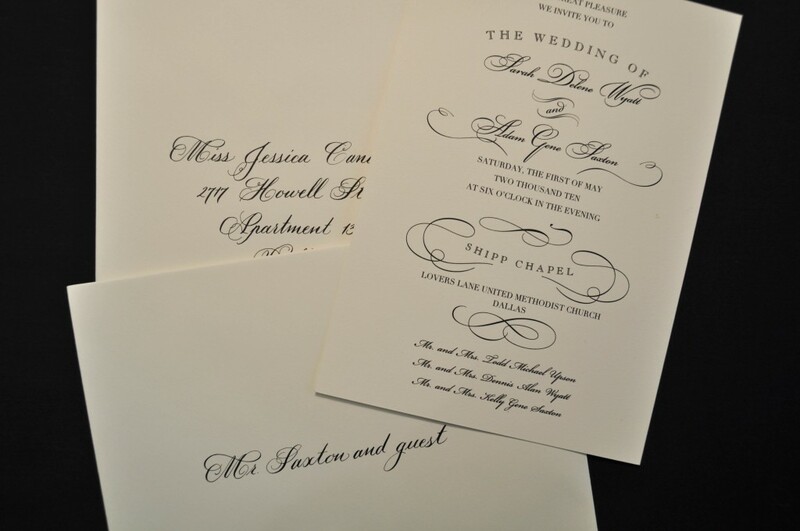 Last summer I had the pleasure of working with Hollye of Carta Creations and her client Jan. Jan was planning a white party in celebration of her husbands birthday and decided to start with a bang and have the invitations completed in hand calligraphy and then printed using thermography on super thick Crane’s lettra paper. I love the result of the bronze and blue. 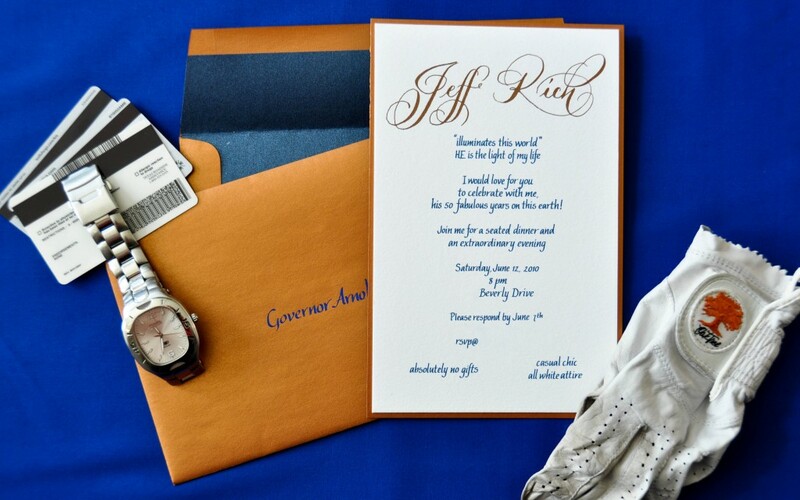 I used a custom designed logo for the name at the top and italic for the rest of the invitation. What do you think of the font combo?